A suspect has been detained by the Tincan Island Command of the Nigeria Customs Service (NCS), in connection with the importation of 40 and 20 feet containers loaded with Tramadol tablets allegedly smuggled from India. Command controller, Musa Abdullah, told newsmen that the seizure came against the backdrop of the ban on codeine syrup by the Federal Government. The containers were intercepted by officers of the command after there were attempts to smuggle them out of the seaport. Abdullah said: “Despite efforts to discourage importation of illicit drugs, some unrepentant fellows still engage in such misdemeanour. 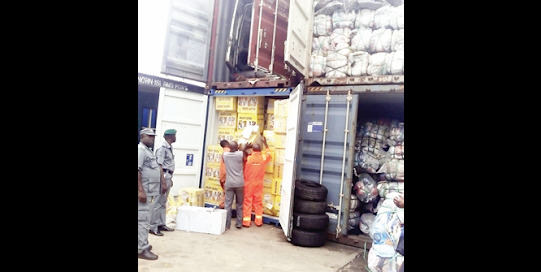 One by 40 and 2 by 20 containers of Tramadol Hydrochloride 225mg, were detained, which were declared electrical static converters and ciprofloxacin.